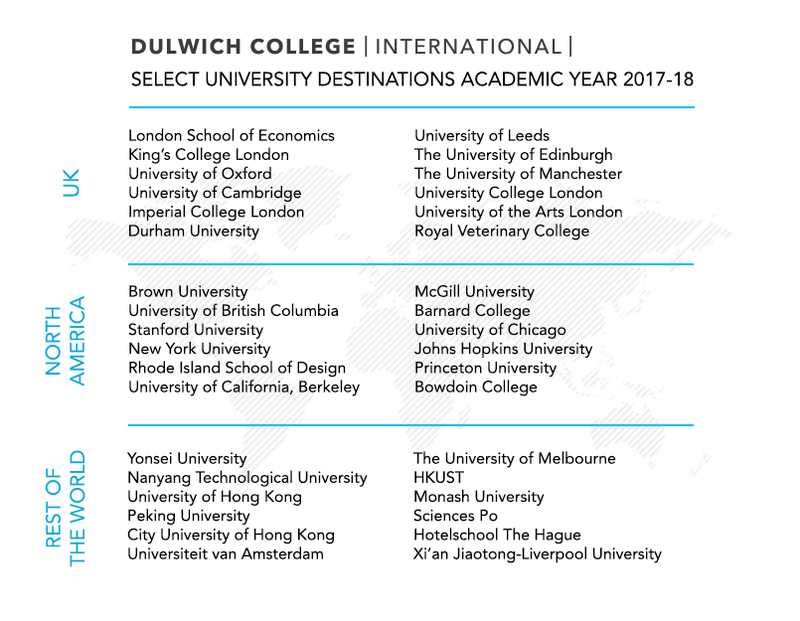 The student journey is unique for every family and individual, which is why Wellbeing and Guidance at Dulwich College International is at the core of everything we do, and is crucial to supporting a robust university counselling programme. We believe that student success inside and outside of the classroom is rooted in a student’s ability to exhibit resilience and flexibility in an ever-changing world. We offer a holistic, student-centered approach to guidance and wellbeing to all students from Early Years throughout Senior School. All students engage in the Dulwich College Success Plan, a developmentally appropriate, personal enrichment curriculum that encompasses all areas of student development and self-discovery. We provide students with countless opportunities for academic, extracurricular and personal growth and reflection, resulting in the creation of personal learner profiles that are updated and reviewed on a regular basis, providing insightful understanding of every student at every level. Such insight provides our educators with pertinent information needed to support students in setting goals and making sound decisions throughout their journeys. When students are introduced to our unique university and careers counselling programme, insights and unique information from students’ personal learner profiles is used to support students in continued self-understanding in Year 7 before shifting focus to university and career research in Year 10. Therein, students are guided in understanding popular university systems throughout the world, in the creation of personal essays and resumes and through the application process. Additionally, students are taught how to evaluate and research a university’s ethos, values, curriculum and faculty to demonstrate informed interest and ensure best fit for our students and families. By building a philosophy of self-confidence and self-awareness that starts early on, our progamme ensures students are in a position to realise well-informed dreams and leave Dulwich university-ready and worldwise. Our students not only receive personalised guidance from university counsellors at their school, but also benefit from support that comes from having experienced counsellors with diverse backgrounds and area-specialties sharing best practice throughout the Dulwich College International network of schools. Many of our counsellors serve on the International ACAC (Association for College Admission Counseling), working on committees alongside university representatives and admissions officers. Through this our university counsellors are able to leverage the Dulwich name and network to lead global sessions for professional learning and development around the world. Though we no doubt applaud our graduating students each year for receiving offers from top universities, colleges and specialty programmes across the world, we place more importance on the fact that through our unique and extensive University Counselling programme, our students are able to attend the colleges and universities that best fit their interests and goals, irrespective of rankings. Initially, Andres only considered pursuing universities in Virginia as he has family there and was interested to obtain in-state tuition to make the cost more affordable. However, during the meetings and conversations with his counsellor, Andres began exploring what would truly make him happy at university. As a lover of the outdoors and calm environments, Andres desired a location that would give him the opportunity to take advantage of his surroundings while pursuing a top-notch education. He was also interested in pursuing a major in environmental studies or something related to sustainability. Therefore, he chose places such as California, Colorado, Vermont and Virginia. Overall, it was clear that it wasn’t about the quantity of the universities that Andres selected to put in an application, but it was making sure that these universities were the right matches and fit for him. Since an early age I had my sights set on attending university in the United States. I knew I wanted to be in or near a large city and that I wanted to be on the East Coast for its more liberal political climate. I had been interested in pursuing a liberal arts education for a long time, and I was also very interested in theatre and performing, so I wanted to find universities that provided me the best resources for continuing these activities. One crucial part of my university selection process was undertaking campus visits. Another factor that helped me decide on the universities I ended up applying to was the process of writing my supplemental essays. Whereas I found it extremely easy and satisfying to answer the supplemental questions of some universities, there were others where I spent a long period of time unable to actually write down anything that sounded genuine, and it was these universities that I ended up removing from my list. I had decided on my top three universities as they fit well with all of my preferences, and both the physical and social atmospheres of the campuses had made me feel a sense of comfort and belonging. My university counsellor helped by introducing me to other universities that were similar to the ones I was already interested in, but were much more reachable so that I had a safety net. During the period of time the applications were due, I was already very busy from my various IB classes, so by setting small, short term deadlines for the different components of my application, my counsellor also helped me divide up to workload so that my application process ended up being very smooth and not pressure-inducing at all. Cherry began with three strong ideas for her potential major, and thus she started with a cursory search for universities with strong programmes in these areas. From her initial list of 20 universities she began narrowing down based on their location, course requirements, international student services and other factors she deemed important. Although she did reference QS rankings, Cherry found that they were far from the most important aspect for her. She notes that University of Toronto is ranked higher than McGill, but her love for French culture in Quebec in addition to the programmes offered led her to ultimately choose McGill University. From early meetings in Year 12 with his counsellor, Howard had always expressed a strong interest in entrepreneurship and business, but he wasn’t sure where to start with building a list of universities. His interests were so varied, from basketball to drumming, lattes, anime, intellectual conversations and a range of potential academic disciplines. Together with his counsellor, Howard started to discuss liberal arts colleges (LACs), and the breadth of the curriculum along with the community focus of the institutions resonated strongly. As Howard’s research progressed, it became clear that student outcomes from a college like Bowdoin are often stronger than many of the nationally ranked universities he was considering. By mid-September of Year 13, Howard was quite sure that Bowdoin was a perfect fit. He knew its culture, core programmes, and even where to find the best latte in the surrounding town. This realisation coincided with Bowdoin making a visit to Dulwich College Suzhou. During the visit, Howard attended the Bowdoin presentation and then took the time to talk to their admission officer. Howard’s final list included other fantastic LACs and a few great mid-sized universities that offer flexibility and excellent undergraduate experiences. He did a fantastic job of finding a range of schools on the continuum of competitiveness while not sacrificing any of his core values and expectations of the undergraduate experience. In the end, Howard was accepted to eight of ten of his schools. Although he had other great offers, including some generous scholarship awards from other institutions, Howard made his choice easily – nowhere matched the feeling of fit like Bowdoin. I initially chose to go to the US, picking schools mainly based on their location, but also picking schools that specialized in the subject I was interested in like University of Michigan for engineering. Later, after not scoring very ideally on my ACT, I realized that my chances of getting into my target schools weren’t as high as I would’ve liked. Additionally, I discovered that I had little interest in the core curriculums US colleges offered, as I wanted to focus solely on STEM subjects. Therefore, I made the decision to apply for UK schools, with Imperial College London as my reach school. During my interview with one of the professors, he told me about the projects graduates and professors were doing at Imperial as well as the wide network Imperial had with companies all over the world regarding research on cutting edge technologies. As someone who has been interested in electronic hardware since a very young age, I knew that I would love it there. The university counsellors supported me so much throughout this entire process. When I felt the need to add UCAS to my application, my counsellor made sure I was absolutely sure that I wanted to make the change before allowing me to, showing that she truly wanted the best for me. Melissa has known for a long time that art was what she wanted to pursue at university and had been meeting with her counsellor to discuss university options since the beginning of Year 12. Additionally, Melissa had attended a summer programme at California College of the Arts in the summer prior to Year 13 that had solidified her decision to study art and help her decide in which country she wanted to study. During meetings with her counsellor, Melissa was able to talk about her experiences that summer and identify factors that she felt were important for a strong and valuable educational experience. While there are universities with art programmes/degrees, art institutes and art and design colleges, it was known that every place that offered art would not necessarily have the courses that were important to Melissa. Melissa and her counsellor were able to work together to identify courses she Melissa was truly interested in, thus narrowing down the list to nine institutions and then eventually eight. From portfolio reviews, to attending information sessions, to making appointments with university counselling to revise and review essays, Melissa made it a point to make the university application process a priority. Therefore, it is no surprise that Melissa received favourable offers from seven out of the eight places where she had submitted applications. While her final decision wasn’t easy, she decided that based on location, programme and overall student happiness and satisfaction with the university, she would be proud to be a member of Parsons School of Design at The New School in New York City this fall. Cyril had clearly stated interests in pursuing medicine from an early age. He completed summer-long work experiences in both India and China and gained significant insight into the medical field. Cyril took advantage of a job shadow opportunity made available through the counseling office at a clinic in Shanghai. Upon returning from his experience in Shanghai, Cyril seemed prepared to focus on researching further. His counselor challenged him to develop a clear understanding of the odds of acceptance. This was done by first comparing his predicted scores with others on the course and then by identifying the total number of seats offered to international students on medical courses at each institution. Although his predicted scores were strong, he understood the fiercely competitive nature of medical courses globally and identified some safety options for himself. One safety option was a non-medical course in the UK, and another was a unique medical programme at Queen Mary’s Malta. The bulk of the counselling work with Cyril was spent pressing him to consider and articulate his choices. When it came time for the applications itself, Cyril was very strategic about re he chose to send his four UCAS medicine applications. When his university decisions came back he was offered medical placements at the University of Manchester and the University of Sheffield. At that point he was happy to make Manchester his insurance option and Sheffield his firm choice. He then withdrew his other applications in the UK and decided not to apply to the Queen Mary’s Malta medicine course. To learn more about matriculation data and school profile information, please download the form below. To arrange a school visit, please download the form below.